Estate tax is a form of transfer tax imposed by state and federal government on property passed on to others after your death. Many estates won’t owe estate tax, as the exemption limits have increased greatly over the past two decades. Even with good planning and no actual taxes due, filing tax paperwork with the federal government and/or the state of Washington may be required. The limit on assets before federal estate tax must be filed has changed over time, and as of 2016, an estate’s gross value must exceed $5,450,000 before filing is required. This number changes regularly, so check with an estate planning and probate attorney or the IRS for the most current amount. The estate’s gross value should also include half of any community property shared with a spouse. An attorney can help you with this calculation if you’re not sure what to include. If an estate is required to file for federal taxes, it will generally also be required to file for the state of Washington, as the state’s exemption amount is lower than the federal government’s exemption. As of 2016, if the decedent’s estate is valued equal to or greater than $2,079,000, Washington requires that the estate’s executor file for estate tax. Like the federal filing limit, the state limit is adjusted for inflation, so check with an attorney or the Washington Department of Revenue for the most current amount. There are several exemptions that reduce or even eliminate the amount of federal tax that most estates have to pay. The largest is usually the personal estate tax exemption. For 2016, the federal personal exemption amount is the same as the value that triggers the need to file. Thus, $5,450,000 may be transferred completely tax-free, regardless of who is receiving the assets. The other common large exemption is the marital exemption, through which a surviving spouse can receive the entire estate tax-free, as long as the assets are passed directly to the spouse. There are multiple other deductions that may be claimed as well, including certain debts, charitable giving, legal claims filed against the estate, funeral costs, and expenses related to the estate’s administration. 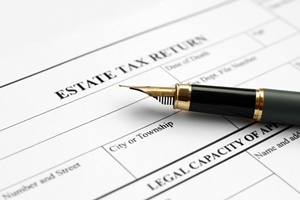 One way to reduce the estate tax burden for your heirs is by using the gift tax exemption. The federal government currently allows up to $14,000 per year, per recipient, to be transferred tax-free. This amount does not get taxed, and does not count against your estate’s personal tax exemption. If you’re married, you and your spouse together can give away $28,000 per year, per recipient, tax-free. If you exceed those amounts, the excess will be subtracted from your estate’s personal tax exemption when you die. Good estate planning can be crucial in ensuring that heirs to an estate are burdened with as little estate tax as possible. Whether you’re planning for your family’s future now or you’ve been appointed executor to the estate of a loved one, seeking professional help from an experienced estate planning and probate law firm can help. At the Law Offices of Molly B. Kenny, we have over two decades of experience helping people successfully create and manage their estates or administer the estates of their loved ones who have died. We understand that estate planning can be tough to think about, and we want to help make the process easier, so you can move forward with your life. You can reach us and arrange a consultation in our Bellevue offices by calling (425) 460-0550.